Greta Thunberg: "We are school striking because we have done our homework...We need knew politics. We need knew economics." 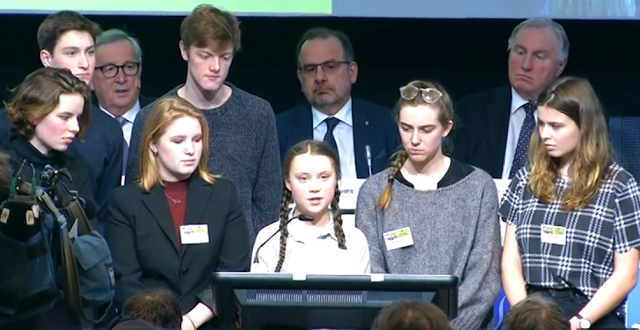 While tens of thousands of children were climate striking and marching through the streets of Brussels, Greta Thunberg addressed the European Economic and Social Committee at the EESC event "Civil Society for rEUnaissance". Greta articulated that it is time for politicians to listen to the scientists and the science, "We don't have any other manifestos and demands. Just unite behind the science. That is our demand." she said. She argued cogently that politicians don't want to talk about the climate crisis, but raise conspiracies to mask their own inadequacy in addressing a problem that has gone on for decades with little action. To answer the argument put forward that students should be in school, Greta suggested that adults should take the place of students on the street, striking for change, "or better yet, join us to speed up the process." she said. Greta addressing the student climate strike rally in Brussels: "we will be a pain in the arse, we will keep on striking until they do something"
The student climate strike in Basel Switzerland, has resulted on Wednesday in the city declaring a climate emergency, passing the resolution by a two thirds vote (by 71 votes to 17 against and 6 abstentions). The resolution was drafted by climate strike kids. "Tens of thousands of children are school striking for the climate on the streets of Brussels. Hundreds of thousands are doing the same all over the world. "We are school striking because we have done our homework. And some of us are here today. People always tell us they are so hopeful. They are hopeful that the young people are going to save the world. But we are not. There is simply not enough time to wait for us to grow up and become the ones in charge, because by the year 2020 we need to have bended the emissions curve steep downwards. That is next year. We know that most politicians don't want to talk to us. Good, we don't want to talk to them either. We want them to talk to the scientists instead. Listen to them. Because we are just repeating what they have been saying and saying for decades. We want you to follow the Paris Agreement and IPCC reports. We don't have any other manifestos and demands. Just unite behind the science. That is our demand. When many politicians talk about the school strike for the climate, they talk about almost anything except the climate crisis. Many people are trying to make the school strikes a question of whether we are promoting truancy or whether we should go back to school or not. They make up all sorts of conspiracies and call us puppets who cannot think for ourselves. They are desperate to remove the focus from the climate crisis and change the subject. They don't want to talk about it because they know they cannot win this fight, because they know they haven't done their homework, but we have. Once you have done your homework you realise that we need knew politics. We need knew economics where everything is based on a rapidly declining and extremely limited global carbon budget. But that is not enough. We need a whole new way of thinking. The political system that you have created is all about competition. You cheat when you can because all that matters is to win, to get power. That must come to an end. We must stop competing with each other. We need to co-operate and work together and share the resources of the planet in a fair way. We need to start living within the planetary boundaries, focus on equity and take a few steps back for the sake of all living species. We need to protect the biosphere, the air, the oceans, the soil, the forests. This may sound very naive, but if you have done your homework you know we don't have any other choice. We need to focus every inch of our being on climate change, because if we fail to do so then all our achievements and progress have been for nothing. And all that will remain of our political leaders legacy will be the greatest failure of human history, and they will be remembered as the greatest villans of all time because they have chosen not to listen and not to act. This does not have to be. There is still time. According to the IPCC report we are about 11 years away from being in a position where we set off an irreversible chain reaction beyond human control. To avoid that, unprecedented change in all aspects of society need to have taken place within this coming decade, including a reduction in our CO2 emissions by at least 50 percent by the year 2030. And please note that those numbers do not include the aspect of equity, which are absolutely necessary to make the Paris Agreement work on a global scale. Nor do they include tipping points, or feedback loops, like the extremely powerful methane gas released by the thawing Arctic permafrost. They do however include negative emission techniques on a huge planetary scale that is yet to be invented, and that many scientists fear will never be ready in time, and will anyway be impossible to deliver at the scale assumed. We have been told that the European Union intends to improve its emission reduction target. In the new target the EU is proposing to reduce its greenhouse gas emissions by 45 per cent below its 1990 levels by 2030. Some people say that is good, or that is ambitious. But this new target is still not enough to keep global warming below 1.5 degrees Celsius. This target is not sufficient to protect the future of children growing up today. If the EU is to make its fair contribution to staying within its carbon budget of the 2 degree limit, then it means an 80 percent reduction by 2030, and that includes aviation and shipping. So around twice as ambitious as the current proposal. The actions required are beyond manifestos or any party politics. Once again they sweep their mess under the carpet for our generation to clean up and solve. Some people say we are fighting for our future, but that is not true. We are not fighting for our future, we are fighting for everyones future. And if you think we should be in school instead, then we suggest you take our place in the streets, striking from your work, or better yet, join us to speed up the process. I am sorry, but saying that everything will be alright and continue doing nothing at all is just not hopeful to us. In fact, it is the opposite of hope, and yet this is exactly what you keep doing. You can't just sit around waiting for hope to come. Then you are acting like spoiled irresponsible children. You don't seem to understand that hope is something you have to earn. And if you still say we are wasting valuable lesson time, then let me remind you our political leaders have wasted decades through denial and inaction. And since our time is running out we have decided to take action. We have started to clean up your mess, and we will not stop until we are done." Just as climate change has been driving up temperatures in Australia to record levels, the political temperature is also rising for a climate election for May 2019. Australia has just experienced its hottest December on record, followed by its hottest January. It's already been a very hot summer with record breaking temperatures, and it's not yet over.